Hi Amazing Kids! Of course there is not a more fun month of the year than December – lots of celebrations, food and time with family. For a bit of history: December 4, 1877, the phonograph was invented, on December 13, 1911, the South Pole was discovered, December 21, 1620, the first Pilgrims landed and on December 22, 1882, the first Christmas lights were sold. For this month’s menu, I want to share with you our meal we serve on the eve of Christmas Eve. 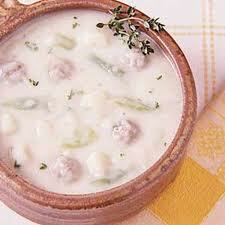 On the 23rd each year we prepare a simple feast of soups and breads. My older siblings usually arrive this day to stay for awhile and we invite friends to stop by for a visit. The evening is busy so our simple buffet of food makes it easy to spend the time with our family and friends. On the stove we have 3 different soups simmering and a big stack of bowls for friends and family to sample. The soups sometimes change, but these are three of my favorites. A bit of history: Eliza Acton was the first to record the recipe for this soup in 1857 in her book “Modern Cookery for Private Cooks.” She was unsuccessful as a poet, but she did find success in writing her cookbook. Heat the oil in a large pan and sauté garlic, onion, and celery for about 2 minutes. Add the apples and sauté for 2 more minutes. Mix in the flour to mixture. Add broth, spices, beans, chicken and bring to boil. Turn heat down and simmer until chicken is cooked. Stir in half and half, lemon juice, salt and pepper. 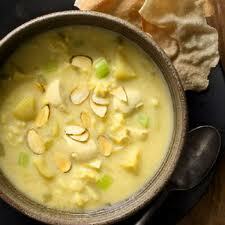 Serve soup with almonds on the side as a garnish. A bit of history: This soup originated in Haiti and was served at the first Independence Day, January 1, 1804, from the French. To this day, this soup is still served this celebration day. In large pan heat the olive oil and sauté the onions until tender. Add the pumpkin, broth, water, nutmeg, and cinnamon. Bring to a boil and then simmer for 5 to 7 minutes. Stir in milk, half and half, salt and pepper. Serve with yogurt as a garnish on the side. 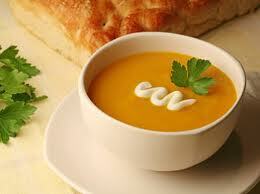 A bit of history: In the late 1700’s the German Immigrants living in Pennsylvania were famous for their potato soups. In a medium pan, heat oil and sauté garlic, onion, and sausage until sausage is no longer pink. Drain the mixture and wipe the pan clean. Add the mixture back in the pan and add water, broth, potatoes, mushrooms and red pepper. Bring to boiling and then simmer until the potatoes are almost done (still firm). Add the kale and simmer until it is tender. Stir in the half and half, fresh parsley, salt and pepper. Note: If using Idaho potatoes or potatoes with thick skins, either peel or partially peel the potatoes. OK, back to more fun stuff. One last tradition I want to share is, my mom tries to find a really unusual kitchen gadget that is placed on the Christmas dinner table. Throughout the meal we pass the gadget around and try to guess what it is and we have a lot of fun. My first recollection of this tradition was the year of the “pie bird”…..no one guessed it that year! In 1836, Alabama was the first state to recognize Christmas as an official holiday. Animal crackers which are Barnum’s circus-like boxes were designed with strings on them to be hung on Christmas trees. 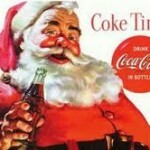 The first singing commercial made in the world was aired on the radio on Christmas Eve in 1926. The commercial was for Wheaties cereal and it was a big success. If you collected all of the presents in “The Twelve Days of Christmas” you would have 364 total presents. Christmas dinner in early England was the head of a pig prepared with mustard. Yucky! 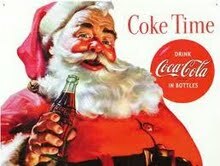 Coca Cola was the first beverage company to use Santa Claus in a winter promotion. In the United States we have cities named Santa Claus in Indiana and Arizona, Noel in Missouri, and Christmas in Arizona and Florida. Thanks for reading my column. I wish you and your family a very Merry Christmas and a very happy New Year!